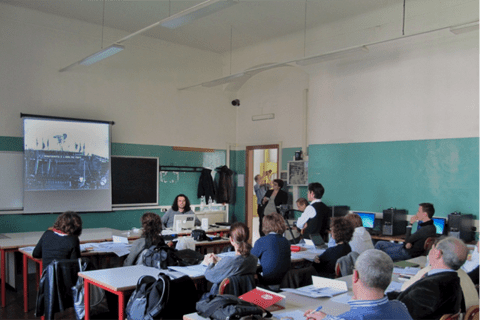 On April 20 and 21st, the Istituto Amedeo Avogadro (IIS), a large technical school in Torino is home to a workshop on the use and re-use of video materials for learning. This workshop is aimed at teachers in primary and secondary education that want to adopt media and more specifically video and audio in their classroom activities. The workshop is organised by partners in the MEDEA2020 project, a project that supports the MEDEA Awards – the annual competition that recognises and rewards the best use of media to support teaching and learning. Marco Rendina from LUCE is part of the workshop team, leading a session on unlocking European media archives and highlighting the work of EUscreen. Mathy Vanbuel, one of the originators of the MEDEA Awards and project partner in both EUscreen and MEDEA2020, is leading a session on working with the EUscreen platform and other platforms to mash up, edit and create your own materials.